No, really, this is my new favorite hobby. Take a delicious vegetable and make it even more delicious by soaking it in vinegar and spices. Genius! Since I’ve been having so much fun pickling veggies this summer, I knew I need to make the ultimate pickle classic: the dill pickle spear. However, conquering the classic dill pickle spear made me slightly nervous. You see, my husband LOVES dill pickle spears. He even has theories on which brand of pickle spears are the best. He only likes the pickles that come from the refrigerated section and swears that they are crunchier than the sad pickles on the regular old grocery store shelf. He’s really into pickles. 24 Hour Dill Pickles (aka refrigerator pickles). Combine water, vinegar, salt, and sugar in a small sauce pan. Bring to a boil, then set aside and let cool. Add the mustard seeds, peppercorns and whole allspice to a large mason jar. Pack in as many cucumber spears as will comfortably fit in the jar, and then pack in the dill sprigs and pieces of garlic. Once the water & vinegar mixture has cooled (i.e. the brine), pour the liquid over the cucumbers in the jar. Seal with a clean lid and refrigerate for at least 24 hours before eating. will you make some for krispin’s birthday? he too is obsessed with pickles. Is there any reason why slicing cucumbers wouldn’t work for dilling? We are growing a ton and pickles sound delightful. I’m making some this weekend. 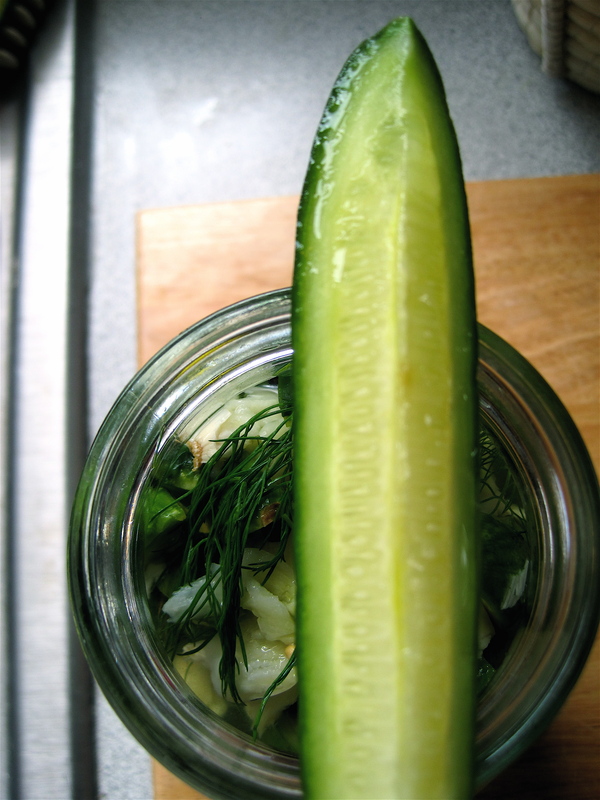 We arrived home to find giant cucumbers in the garden and although the meat is delish the skin is quite tough…so…pickling sounds like the perfect solution! Thanks for the recipe. I hate to admit it now because it’s just gross, but when I was a kid I loved dill pickles enough to drink the juice! As a “grown up”, I’ve been known to spend outrageous money on “designer” pickles sold at our local farmer’s market and have been experimenting lately with making my own. The last I made were bread and butter and were killer on turkey burgers with dijon mustard. This looks like the next recipe in the quest for the perfect pickle. Thanks! They were great – thanks for sharing! Oh these look good. I am also a pickling fanatic – and I have now made a second batch of your divine pickled carrots…so thanks! My family ate your entire jar of pickles that I swapped with you & now I have the “secret” recipe ready for next year! I kept the brine hoping to add more cucumbers soon. I assume it’s okay to use the brine a few times, right? Omg…my family is pickle crazy and we cant keep them in the house, cant wait to try this!!! Maybe I will even try to grow some next year :).